Information » Purchasing a Hedgehog » Why Are Hedgehogs Expensive? 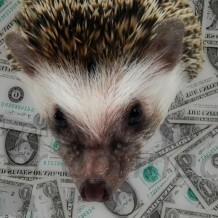 The average pet hedgehog is much more expensive than the average pet guinea pig, hamster, or rabbit. Hedgehogs are exotic animals; exotic or rare animals of all kinds are typically more expensive than average pets or livestock. Hedgehogs have unique care and handling requirements. A good breeder or retailer will spend a considerable amount of time educating his/her customer about these requirements. Part of the price of an animal is the time required to breed and sell that animal. Our Becoming a Breeder guide goes into more detail about some of the risks and challenges breeders face.